Have you ever wondered what it would be like to be an ace fighter pilot? Then today is your lucky day, because the signup for the Queen's Aero Forces Duel has officially begun! Her Majesty invites you for a day of fighting to the death in midair to see if you have the guts to defend your country and please the royal court. You're not the only pilot who's hungry for glory, so fight with skill if you want to come out on top in this fun flying game! 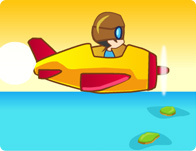 Follow the in-game instructions, use your mouse and keyboard to fly!